This is an interesting one and I'll be straight up here, as probably the marketing behind Bellota probably isn't. On the face of it and on the website, you'd think this is a standalone Cava and Tapas bar in Brighton, with beautiful, slick branding and a pretty fly interior (which I'm a big fan of both). It is however, the first of a sibling brand from the La Tasca chain (which formerly stood on the site) and one which I most certainly didn't rate, with soggy tortillas and microwave pinging tapas. I'm always dubious about these thinly veiled stand-alones that are part of or partially funded by a much larger corporate brand, like Tesco's backed Harris and Hoole or the "inspired by Starbucks" shops. So, knowing that Bellota was a similar sort of thing, I was a little apprehensive ahead of my visit. But, and this is one hell of a but, I was really surprised with my meal here. The food is certainly elevated in terms of quality and preparation. I was just expecting La Tasca food presented in a new package. Anyway, the confit pigs cheeks in syrupy Pedro Ximénez sherry (Love. That. Stuff.) reduction was the main highlight. Soft, succulent meat with the fruity raisin reduction of the PX sherry made for an ideal partnership. I adored this dish and if I closed my eyes I could very well be in Barcelona eating it. It was served with little sautéed potatoes and a steal at £5.25. Another favourite was the battered white fish in San Miguel batter, well from what I could wrestle away from Baby Foodie (I'm going to stop bringing him on reviews, he eats too much). Crisp and light fingers of soft white fish were perfect for dipping into the mild alioli. It was presented nicely too in a cute little wire basket on an olive wood board. The fish dishes all sounded great actually, with lots of mixed fried fish, salt-baked tiger prawns or pan fried squid with crispy chorizo and squid ink and wine sauce. Aubergines are one of my favourite vegetables, and whilst nothing, NOTHING, will match my mammas parmigiana, the rolled parcels filled with goat's cheese and sweet peppers still had bite, despite served in the tomato sauce. Nice. I couldn't really detect much of the garlic and cider in the chorizo dish and I prefer mine cooked a little more so the sauce reduces to a sticky ooze with the fat of the chorizo melted out for bread dipping. Still it's chorizo. Who doesn't like chorizo? The Patatas Bravas was the only mediocre dish. Perfectly edible but a bit flat in taste. There was so much more I could have ordered. The cured meats, sat whole on the bar ready for carving, the baby squid, all of the cheeses and I can't believe I forgot the Padron Peppers. Desserts are limited but that's ok. 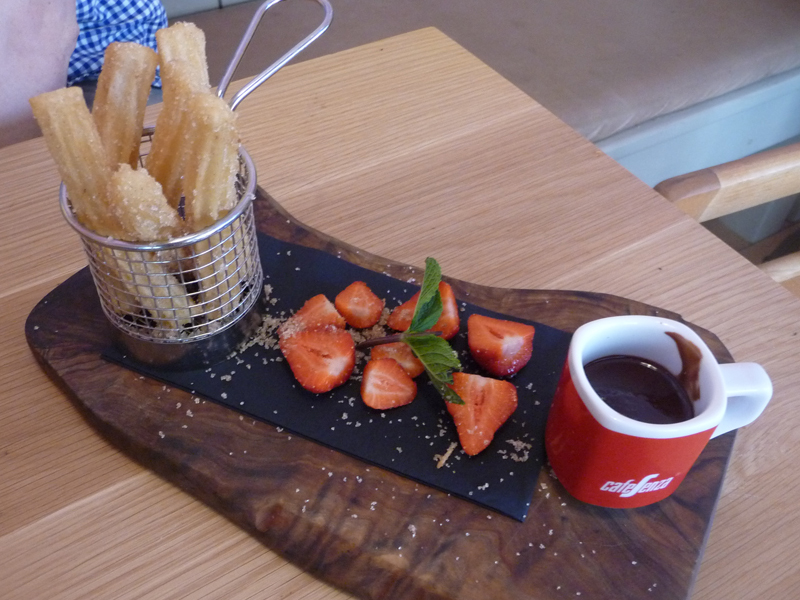 The churros to share were as good as the ones we've had in Spain. Really crisp (the person on the fryer was having a great day), light and fluffy as you would expect, dusted with sugar and cinnamon and served with a pot of chocolate for dipping. They were an ideal full stop to a meal washed down with a couple of espressos. My crisp glass of Codorniu Semi-Seco Cava, was refreshing, sweet and irresistibly gluggable and the cava list will be something to draw me back here. I'll be returning to make use of the front bar with a glass of this in my hand and a dish of olives as my aperitif to a night out. As we are not exactly teaming with tapas options in Brighton, this is a welcome addition for a laid back meal or drink and snack as tapas is intended. 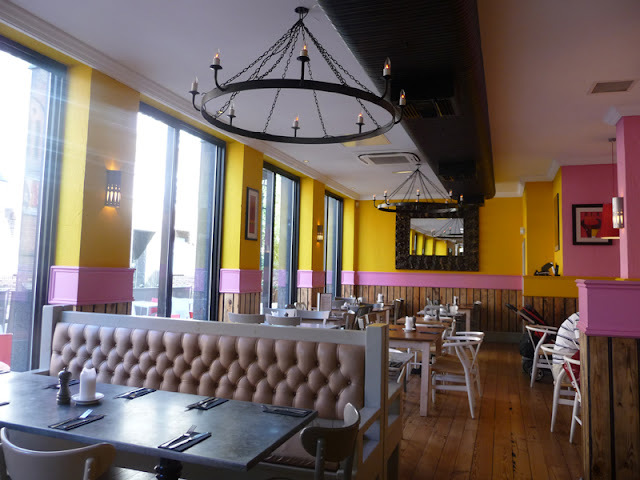 I really did enjoy me meal here, and although there are more premium places for small plate dining, like Plateau for example, if you were craving Spanish food then you'd get a decent taste of it here. And the best thing is that you can enjoy your food in a contemporary environment that doesn't try and emulate the tourist resort of Costa Del Whatever with checked tablecloths and frilly dancing. I'd call that a result. I was invited to review Bellota.